More than 5,000 jobs will be created in Manchester thanks to a new road improving connections in and around the city to its airport. 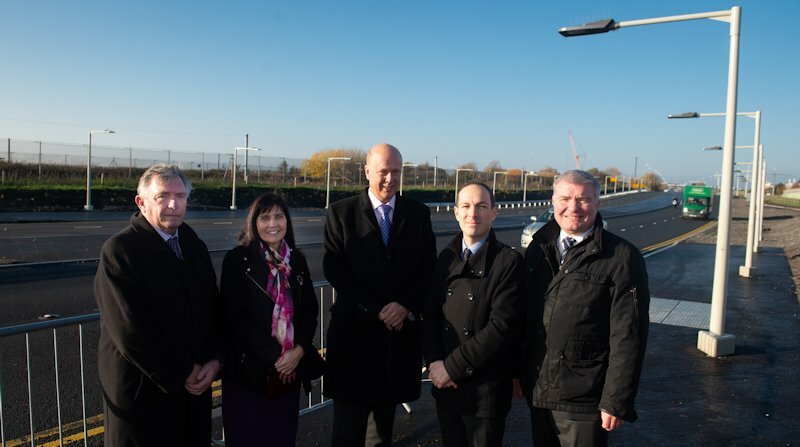 Transport Secretary Chris Grayling officially opened the A6 Manchester Airport Relief Road today (Thursday, November 15), which the Department for Transport contributed £165million towards and which is already shaving a tenth off motorists’ journey times. The £290 million dual carriageway, which links the A6 at Hazel Grove to the M56, also provides better connections to the £1billion Airport City business park and development sites in Handforth Dean and Woodford – and will deliver a £2.5 billion boost to the regional economy. “We are investing more in improving our roads than ever before – making it easier, safer and quicker for people to get where they want to go. “This new road will not only make it easier for people to get to the airport and away on holiday, but it will help businesses in the North West improve their access to world trade through flights from Manchester. Alongside the road, a new pedestrian and cycle path is giving people alternative travel choices to the airport and nearby business park. “This new road connects Manchester Airport with the people and businesses of Stockport, Manchester and East Cheshire. It was only made possible by Department for Transport and Greater Manchester Combined Authority funds and it is a good example of central government working together with a city-region to deliver major infrastructure that improves people’s lives. “The A6 to Manchester Airport Relief Road will enable people to make quicker and easier journeys, and will cut congestion, especially on local roads. The supporting cycling and walking infrastructure will also make active travel more attractive and safer for more people and supports our ambition to make them the first and natural choice for short journeys. The government is investing £3 billion in improving journeys on the North’s roads and motorways, and tackling congestion, including upgrading stretches of the M1 and M62 into smart motorways. The DfT will also make available funding of more than £109 million towards other local road schemes in the area – Poynton Relief Road, Congleton Link Road and Middlewich Bypass. Greater Manchester also received a £69.5 million boost from the Budget, bringing its Transforming Cities Fund total to £312.5 million. This fund is designed to improve public transport links to jobs, and the authority has decided to invest in better cycling and tram links across the city. Pictured above – L to R: Cllr Ainsley Arnold, Cheshire East Council Cabinet Member for Housing, Planning and Regeneration; Tricia William, Chief Operating Officer, Manchester Airport Group, Chris Grayling, Secretary of State for Transport; Cllr Alex Ganotis, Leader of Stockport Council and Cllr Don Stockton, Cheshire East Council Cabinet Member for Environment celebrate the official opening of the A6 to Manchester Airport Relief Road.